I got to meet both Sams and Stoick at their booth and had a wonderful time learning about their work. They are genuinely excited about what they do and they have a passion for it. It's always a delight to speak with people who are truly passionate about their work! 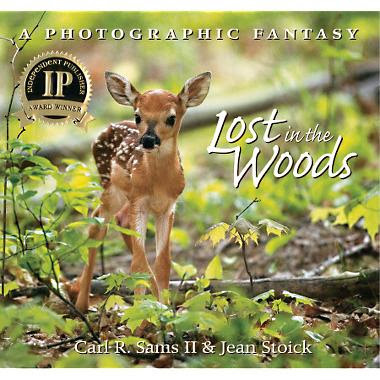 The couple graciously offered me a copy of Lost In The Woods : A Photographic Fantasy for review and I brought it home to read to my children. In this book we meet a baby fawn who is asleep in the tall grass. His mother is not nearby but he is still safe - because baby fawns do not have a scent! Stoick was telling me that one of their hopes for this book in particular is to teach children that if they should find a baby fawn in the woods to rest assured that it's mother is nearby. What frequently happens is that people find fawns in the woods and assume that they've been abandoned. That is not the case though. The mother might sometimes leave her baby for hours but she does so, knowing that because her baby has no scent, it will be safe from predators. The lesson behind the book is to take care of nature by allowing it to grow and go about its affairs naturally. The delight of this book is the photographs which show off the beautiful baby fond as well as many other animals in the woods. We live in a wooded area and just two days ago I looked out the living room window and saw a mother deer trotting her tiny baby fawn across our yard. Spots and all! It was absolutely adorable and we've been talking about it and hoping to see it again soon! Should we find it while we're out and about, we'll know to leave it alone and let its mommy come and take care of it in her own good time. This is a beautiful book and worth the Independent Publisher Award that it was granted. To learn more about the book and accompanying movies, visit 5 Minutes for Books today for my Books on Screen post. You can also learn more about Sams and Stoicks wildlife photography by visiting their website! Here is the Stranger in the Woods website - which celebrates the fact that their book by that title is about to celebrate its 10th Anniversary! Pretty cool stuff! Have fun learning more about them! What a great book! My mother in law had a fawn left in her yard for a couple of days this spring. She enjoyed watching it, even if she doesn't enjoy them eating her plants.